Changing valve cover gaskets and see in the manual to use "sealant" for gasket on valve cover and the half circle cutouts on the head.. Doesn't specific what kind. Factory brand looks tan in color. Other posts I found just say sealant as well.. What are we using? Permatex line has quite a bit of choices.. I use motoseal a lot. 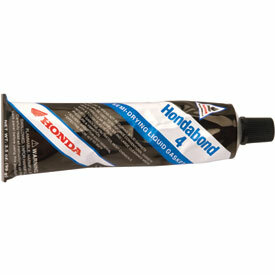 I believe it is the same as Hondbond, which I use @ the shop. Both work excellent. Did anyone bleed the brake himself? Quick Reply: Replacing valve cover gaskets...Which sealant?